HY-VEE school bucks receipt program is winding down for the year. The last date that can be on the Hy-Vee receipts is April 28th, 2019. Thank you for your support! Second graders watch sheep shearing! 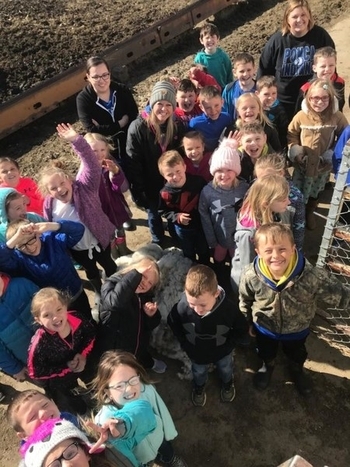 Mrs. Sprakel and Ms. Keifer's second grade class enjoyed watching sheep shearing at Dr. Phil Kramper's farm on Monday, April 15th! Thanks to Dr. Phil Kramper for providing the opportunity for Ponca students. Josie Reid is a Nebraska World Language Distinguished Scholar. She earned the "Honors" award, and she was nominated by Mrs. Camargo, Ponca Spanish Teacher. Congratulations to Josie! High School Music Concert and Awards Ceremony! The Ponca Music Department invites you to attend the Spring Concert and Awards, Monday, April 8 at 7:00 PM in the Fine Arts Auditorium. 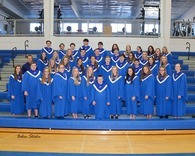 The concert will feature the Jazz Band, Concert Band, Show Choir, and Concert Choir, as we prepare for District Music Contest in South Sioux City on Friday, April 12. Ponca attends the Nebraska Class C All-State Honor Band! On March 23rd, 21 Ponca students participated in the Nebraska Class C All-State Honor Band in Kearney, NE. After rehearsing throughout the day on Saturday, they put on an amazing concert that evening. Students that were selected to participate in one of four ensembles that day, Junior High Band, Symphonic Band, Wind Ensemble, and the Jazz Band. High School Students (Picture on the left) First row: . . .